We were in Le Mans last Thursday and Friday to attend the funeral of a dear friend who had passed away suddenly. 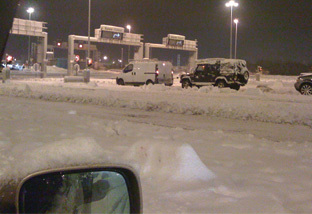 Our plan was to drive back to London taking the 9.45 pm EuroTunnel from Calais to Folkestone on Friday, getting back in good time for the second Winter Warmer Tea Open House on Saturday. 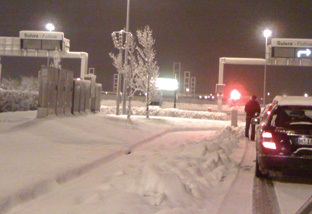 Alas, we were caught in the heavy snowfall en route and eventually got stuck in the boarding queue in at least 20 cm of snow till 4.30 am! Trapped in the car, a thousand thoughts went across my mind. Should I disappoint by cancelling the Tea Open House? If so, how do I contact people who have said they are coming? Would I have time to bake some more Oolong Madeleines? Will I be too tired to talk about tea? Realizing the pointlessness of worry, I turned my thoughts to lovely hot cups of tea, in my imagination savouring the floral aroma of Phoenix Eye Jasmine White tea, the intense sweetness of Lishan Oolong and the warmth and earthy palate of Emperor Pu Erh. It was these thoughts that got me through seven hours of night time sitting in a car covered in snow! I have to thank our lucky stars that we got home by 8 am on Saturday and straightaway, we set the room up for the Tea Open House. I did not manage to bake some fresh Oolong Madeleines but had made a couple of days earlier a goodly supply of Matcha butter cookies which everyone likes. 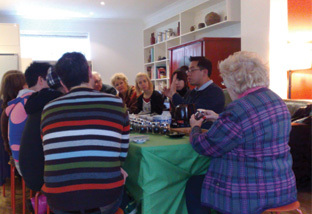 I was honoured to have an even larger crowd for this Tea Open House than last week, especially given this was the Saturday before Christmas! 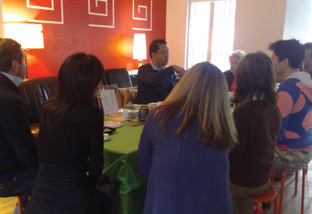 I made many more tea friends and tried my very best to answer all questions about tea. Tina: What a wonderful afternoon. SOOO taste and thought provoking, so multi-layered and as Julian said so philosophical… I am sorry I had to leave. Absolutely fascinating, meditative, life exploring. With every taste a million questions arose, with every explanation another thousand arose. Loved it. THANK YOU. 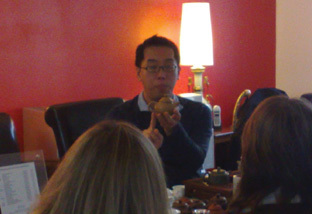 Aeyal: it was a great event and just enjoying the Golden Monkey tea right now! Looking forward to more… So nice to meet you. We’re looking forward to our next Winter Warmer Open House on Sunday 31 January from 12-4pm. We have a lot more RSVPs this time so do come early to ensure a good seat! 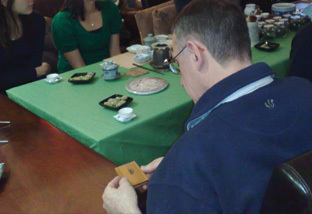 Click here for more details about the Tea Open House. 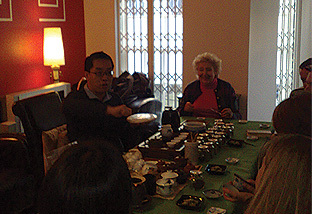 Hope to meet again soon also to come maybe to tea cooking class! I would separate based on oxidation. In general, if done properly a higher level of oxidation (dark oolong) will result in a tea more fruity sweet than floral because the sugars in the leaves would be more caramelised. The basic taste profile of fruity vs floral is enough reason for using different pots. The term “roasting” is a confusing translation. It carries 3 meanings. 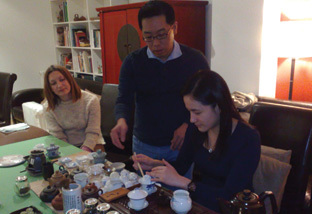 1) using heat to dry the tea leaves, 2) using heat to remove more moisture if (1) is not done completely and 3) using heat to improve the flavour (but do not change the tea’s original main character). I assume you are referring to meaning (3) here when you use the term roasting. 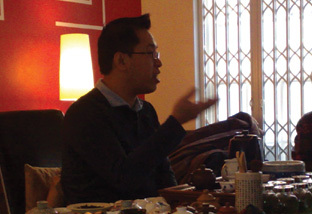 So, one would not attempt to roast a light oolong or pu-erh to “improve” its flavour because the “roasting” process would have changed the tea into a different category; both will become more like dark oolong. Based on this definition, only the darker oolongs can be roasted to improve its flavour and the flavour changing process will not change the original characteristic of the tea, i.e. it is still a dark oolong. Therefore, there is no real need to use a different pot for varying degrees of roasting. However, if there is a particular dark oolong that you really like then I suggest you reserve a different pot for it and not brew other dark oolongs with the same pot. I actually thought that sometimes lightly oxidized oolongs such as tie guan yin are roasted (there is roasted vs non roasted TGY)…? Traditional Tie Guan Yin is (historically) heavily roasted but with the influx of light Oolongs from Taiwan and given that mainland Chinese people prefer green teas, many tea masters in Fujian started to make very lightly oxidised Tie Guan Yin. Although they both bear the same name, I would consider them to belong in different categories of tea. As the lightly oxidised oolongs (like green teas) cannot be kept as long as darker oolongs, some retailers or tea makers “roast” any unsold light oolongs thereby changing their character to be like darker oolongs. They therefore cannot be treated as a light oolongs any more.